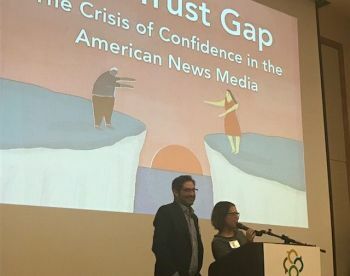 BEND, OR -- Two University of Oregon journalism instructors have traveled the country, this year, to try and determine why people have a general distrust in the news media. A recent poll revealed less than a third of Americans have some level of trust in the industry. She says there are three overall themes that surface in every conversation with news consumers: Diversity, Transparency and Consistency. “Consistency was incredibly important for people in deciding who to trust. They wanted to know what to expect. They wanted reliability." However, she says the most important of those qualities is diversity, "Every single person, every single community we talked to said that they did not feel represented in the news media. And again, ‘news media’ is an incredibly broad category. One woman said something which was really interesting: she distrusted news anchors because they were very attractive. And she felt like their experience was different than hers because they sort of looked and talked a certain way." She says most people want a deeper relationship with the journalists they watch, read and listen to, and they want honest and open reporting. The Bend event attracted local journalists and public officials, as well as the fiancé of former Governor John Kitzhaber. Cylvia Hayes questioned whether distrust in the media has been driven by a lack of industry oversight. "I’ve learned the hard way that the defamation laws are written so it’s virtually impossible for a public figure, which is loosely defined, to have recourse against misinformation." Kitzhaber resigned in early 2015, amid controversy involving Hayes and her work in and outside the Governor’s office.